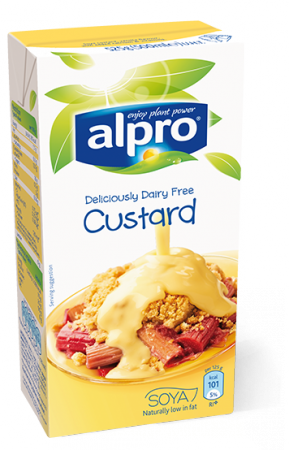 Dare to be different with Alpro Deliciously Dairy Free Custard. Add and edge your menu with our dairy free custard - the perfect accompaniment for a range of desserts including puddings, pies, tarts, trifles and crumbles, or simply on it's own, hot or cold. Alpro Dairy Free Custard is smooth, creamy and fragrant with the flavour of vanilla , it is naturally low in saturated fat and gives your customers a helping of plant powered soya protein, calcium and vitamins B2, B12 and D. The best guarantee to get your guests to come back for more.